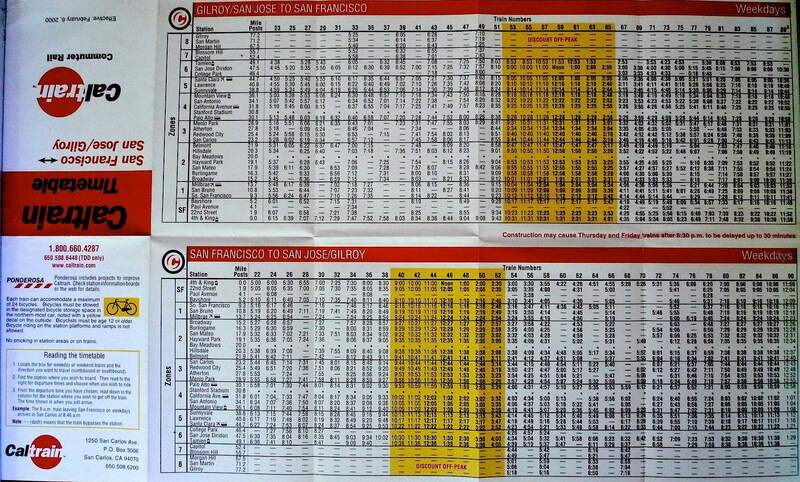 For many years prior to 2004, including throughout the dot-com boom, Caltrain operated an all-stops a timetable with less stop-skipping (see February 2000 example) that fairly well revealed the underlying ridership demand at each station. In 2004, that all changed with the advent of the Baby Bullet. While the Bullet was a marketing triumph and remains a successful source of ridership and revenue, there was an under-reported flip-side to this new service: many small (and not-so-small) stations lost service. Caltrain publishes annual ridership counts for each station, which can be distilled into a single table of historical counts of weekday boardings for each station reaching all the way back to 1992 (download 55kB Excel spreadsheet). 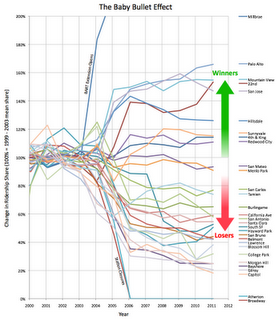 This data reveals interesting patterns. All of these places have more residents and jobs than implied by today's poor ridership, and are consistently under-served by Caltrain. 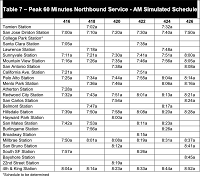 The future timetable plans revealed so far by Caltrain, including their notional electrification timetable and the timetables evaluated in the blended operations analysis, consist of an all-skip-stop service pattern as illustrated at left which "bakes in" the ridership pie slices as they exist today. While the Baby Bullet is slated to be discontinued, its negative impact will live on at the places listed above, which will continue to be served by only two trains per hour (out of six). Stakeholders at those stations should not allow this to happen. 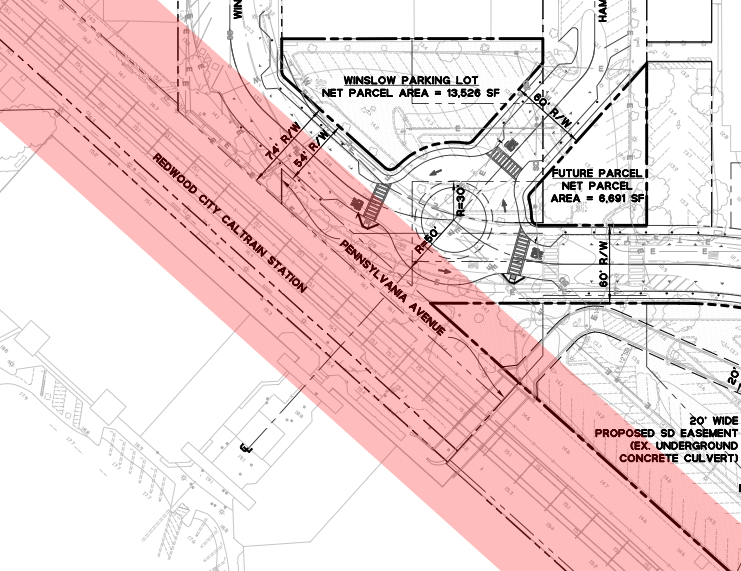 As they plan their future operational concept, it is important that Caltrain base their stopping pattern on raw population and jobs data and not on the highly distorted ridership patterns induced by the Baby Bullet Effect. 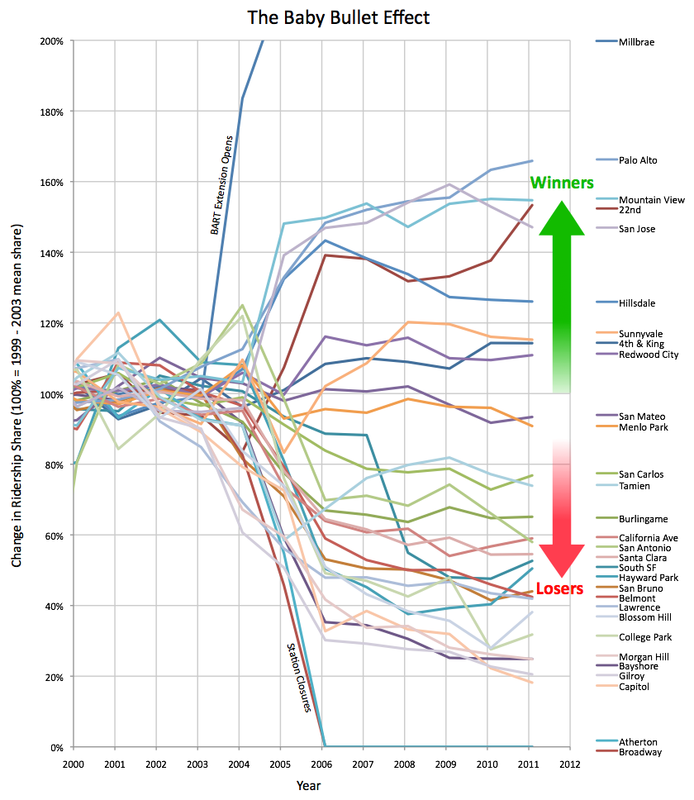 Sometimes, it's useful to look beyond the peninsula for context on what works best locally. 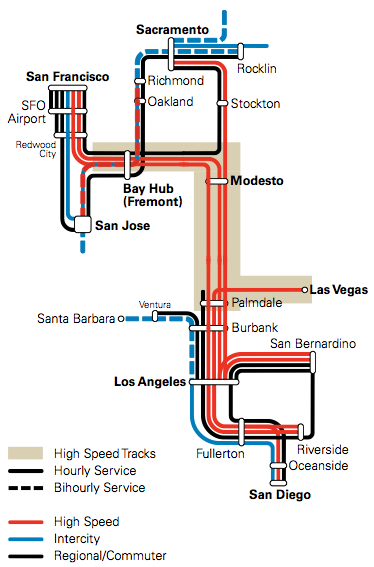 Here's a graphic from Richard Tolmach (in the latest TRAC Newsletter) that pretty much says everything that needs to be said about the California High Speed Rail Project. 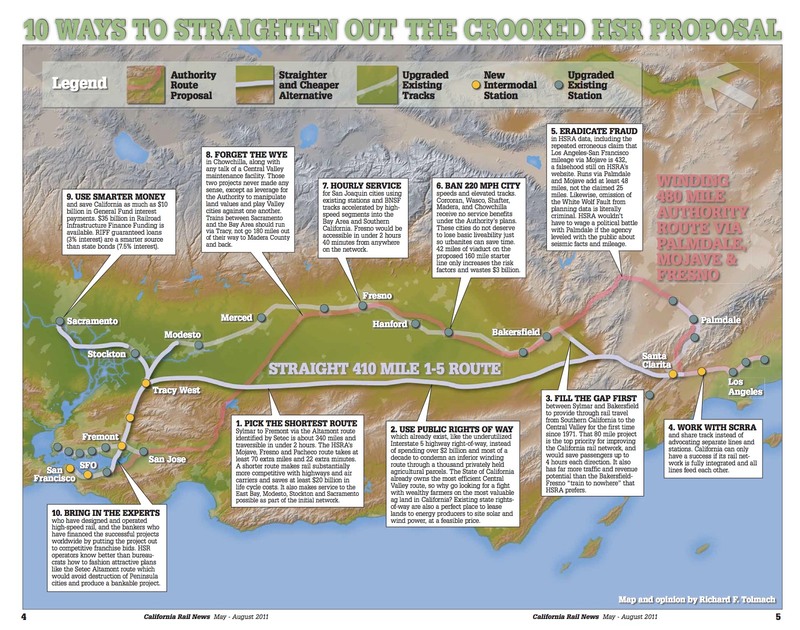 As can be observed, the route that Tolmach and other organizations (including the plaintiffs in the Atherton lawsuits) have been advocating for years is very different from the route that the CHSRA is stubbornly advancing through the environmental clearance process. In the Bay Area, the notable departure from the official plan is that HSR would branch off from the peninsula rail corridor at Redwood City, head over a new Dumbarton crossing, and zoom across Altamont Pass along the SETEC Alignment. What does this have to do with anything peninsular? Plenty, as it turns out. Read on. The increased two-track shared use corridor distance from Whipple Avenue to San Jose Diridon, makes it very difficult for a 110 mph train to leave San Jose without encountering delay prior to reaching the overtake, and for a southbound HSR train to keep from being delayed by the Caltrain train it follows after the overtake. Translation: sharing tracks should be done for the bare minimum distance, and certainly not 50 miles from SF to SJ. Branching HSR off the corridor in Redwood City is a scenario that was NOT analyzed because it runs against Pacheco orthodoxy. There is little doubt that it would make for an operationally superior solution (as computed by our free service pattern generator) with more Caltrain service, more Caltrain expresses, better transfer opportunities, easy-to-memorize clockface service patterns, and 125 mph HSR speeds... better in every way than the best scenarios LTK could come up with given the flawed assumptions of the study. Switzerland arguably has the most advanced, integrated and optimized rail service planning in the world. The Swiss rail operations consultancy SMA+Partners supported a doctoral thesis analyzing the California rail network (including HSR) from an operations perspective. Ulrich Leister's thesis (see executive summary) "applies a lean and rational approach to planning that is network and schedule-based. A precise computer model is used to test different ideas such as infrastructure layouts or train types. 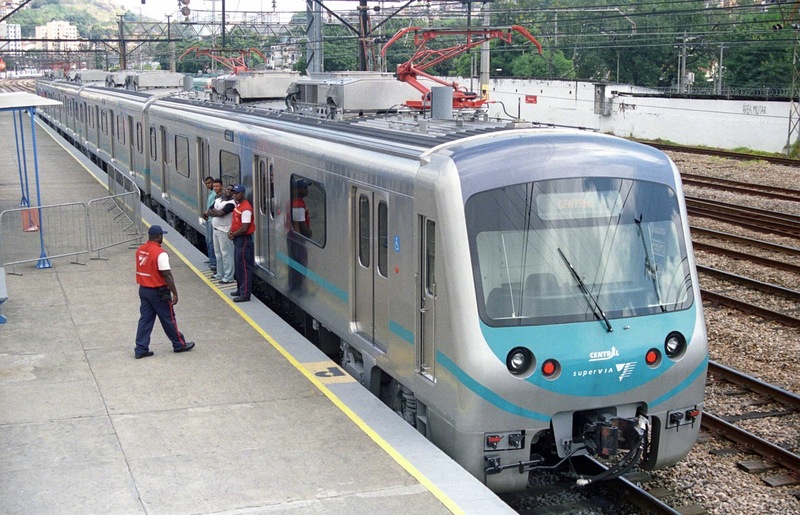 Gradually, the schedule is refined and optimized until the required rolling stock and the minimal amount of infrastructure needed to operate all the scheduled trains is determined." This operations-first approach will likely come as a breath of fresh air to readers bewildered by our local experts' cost-maximizing ways. A full copy of the thesis will be linked here as soon as it is made available. Note in the network diagram at left that the Altamont route is identified as operationally superior, which will come as a surprise to CHSRA consultants who stubbornly insist Pacheco is the only way to go. About a year ago, the East Japan Railway Company gave the CHSRA a peer review of their operations and maintenance approach. Section 2.1.2.6 of this document addresses mixed service with other rail carriers. It is reproduced in full below, with links added to relevant articles that echo the exact same points on this blog. Based on JR East's experience of operating conventional train and Shinkansen train on the same track, following three aspects should be carefully considered. First, the timetable should be carefully planned. The shared operation segment is likely to be the bottleneck of the high speed train timetable since delay in the conventional line will affect the entire high speed trains network. 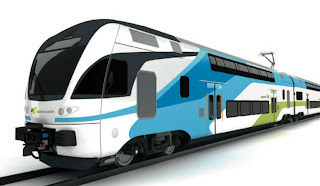 Therefore, if transport capacity is required, 'parallel' timetable (that is, High Speed Train and conventional train operate at the same speed) or increase the capacity of the commuter trains and reduce the frequency will be the solution. To establish a more flexible timetable, additional facilities will be required both in high speed train and the conventional lines. For example, siding tracks are required in stations in this segment, commuter train vehicles with good acceleration should be implemented, speed restrictions on curves should be reduced, more signals should be allocated, etc. Second, rolling stock should be taken account. If the High Speed Train vehicle width is different from that of conventional trains, platforms must be trimmed, and/or boarding steps must be installed either on the high speed train or on the commuter train. These boarding steps may exceed the loading gauge at some areas, so they should be stowed away while the train is running. The difference in height of the doors of the rolling stock should also be taken into consideration. Finally, compatibility of Automatic Train Control system for high speed train and conventional train should be considered. Since the safety equipment is indispensable for either train, multiple safety equipments must be installed on the rolling stock, and radio communication system must also be shared. These must be switched at the border station. Preventing malfunction both on the wayside and on-board is also important. All this good advice has clearly fallen on deaf ears. For example, platform interface coordination is not even remotely on Caltrain's radar, and the HSR project is actively working against it. All of the engineering design work for HSR on the peninsula is predicated on a future service plan described in Appendix K of the Alternatives Analysis, featuring 10 commuter trains per hour per direction and 8 high-speed trains per hour per direction, with no timetable coordination whatsoever. The service pattern generator can now display this for you graphically, showing where four tracks would be needed to operate this particular service pattern. We already knew the answer: four tracks everywhere along the entire length of the peninsula. 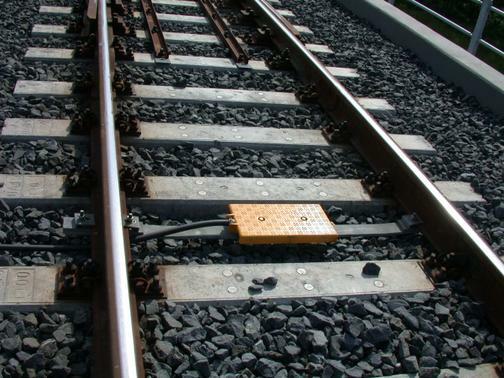 "Phased Implementation" is really about asking where will four tracks actually be needed? Before this concept was floated, the basic idea was to lay four tracks all the way up the peninsula, a solution that requires little intelligent thought, but gobs of money. Phase: a coherent set of capital improvements that enable a new timetable that provides better service, by some agreed-upon set of metrics, as compared to the old timetable. We already described one example of how you might define service metrics for Caltrain, and these could be expanded to measure HSR service quality. The metrics, regardless of how they are defined, need to be timetable-independent, clear, concise, and transparent to the public. Discrete capital improvements, i.e. construction projects, can then be priced out on an individual basis and examined in the context of the new timetables that they enable. The idea is to pick the low hanging fruit first, and to build the improvements that produce the biggest improvement in the service metrics for the least construction cost or community disruption, i.e. the biggest bang for the buck. To exemplify the phased planning process and to make it more accessible to the armchair service planner, we can take the train performance calculations previously presented and fold them into an automatic service pattern generator that generates a graphical representation of a timetable and immediately highlights where additional tracks will be needed on the peninsula corridor. Schedule padding, in percent of the overall end-to-end run time. 10% padding is a reasonable value. Using these parameters, the various overlapping service patterns that describe Caltrain locals, Caltrain expresses, and high-speed trains can quickly be specified. While the service pattern generator may initially take a while to grasp, it is worth experimenting with it to develop an intuition for how a blended service plan could actually work. 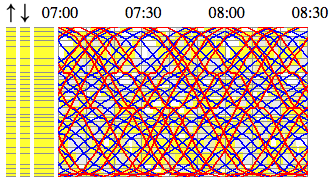 The key output of the service pattern generator is the yellow highlighting that indicates where trains will catch up and overtake. In these locations, triple or quadruple tracks will be required. The challenge is to develop service patterns that provide good service for both peninsula commuters and long-distance travelers, while minimizing the cost and community disruption that comes with additional tracks. Professionals do this using much more powerful software that can quantify how resistant these timetables are to cascading delays, but the ultimate results might not be too far off from what this simplified tool produces, when using conservative values for dwell and padding. Far from trying to do the pros' job for them, this exercise empowers the public to understand the trade-offs that must be contended with. Using the service pattern generator, we can explore a few examples of how to produce maximum bang for the buck. Example 1: here's what Caltrain might look like with a mid-line overtake, often mentioned on this blog as the next logical step after (some would even say before!) electrification. Expresses meet locals at Hillsdale to exchange passengers across the same platform. 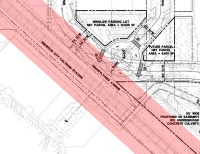 Only one new grade separation is required at 25th Ave. 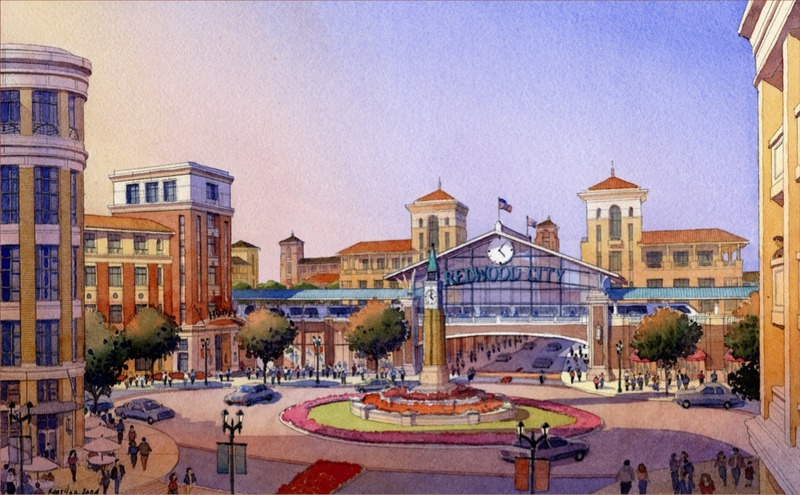 The local holds for three minutes at Hillsdale so that downtown San Mateo can remain with two tracks. 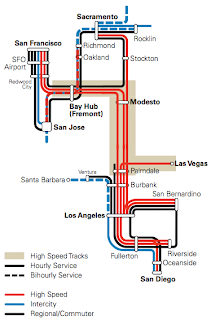 This is a typical illustration of cost vs. benefit: the hundreds of millions needed to quadruple-track San Mateo have to be weighed against the two-minute savings for the local. In this particular example, your metrics would tell you that it's not worth it. Example 2: here's what things might look like with 3 high-speed trains per hour thrown into the mix. We now assume the entire corridor has been upgraded for 100 mph operation, which presumably implies major grade separations and crossing improvements. Introducing HSR requires quadruplication from South San Francisco (well, probably Bayshore) to Burlingame. The bottleneck at San Mateo is allowed to remain with two tracks. Further south, Atherton and Menlo Park are spared while Palo Alto and Mountain View require quadruple tracks. These two new overtake sections illustrate what would be required to provide a reasonable starting level of HSR service via Pacheco. Notice how no enormous civil works are required anywhere in the terminal areas, whether in San Francisco (no expensive tunnels starting at Bayshore) or San Jose (no hulking multi-level station). Transbay to SJ HSR trip time is less than 45 minutes; this can be reduced by increasing the HSR speed limit to 125 mph, but as you'll see if you try it, considerably more construction would be required. Are the few minutes saved worth the extra investment? Example 3: in the never ending Altamont vs. Pacheco debate, Pacheco proponents often point out that this route is clearly best for Caltrain because it "improves" Caltrain all the way to San Jose. Try this for improvement: here's a service pattern where high-speed trains don't gum up the corridor and head for Altamont from Redwood City. This pattern assumes 4 trains per hour Caltrain local, 4 tph Caltrain express, 4 tph HSR to San Francisco, 4 tph HSR to San Jose via the East Bay, and 4 tph of Dumbarton local commuter rail. 20 trains per hour is a very high level of peninsula train service, probably more than the region will ever need... and look! All this is enabled by only two overtake sections, grade separation of the northern half of the corridor, and punchy 6000-kW Electric Multiple Units (and also, to be fair, a new Dumbarton crossing). If you like the power of experimenting with service patterns, there's a contest you can enter! Entries may be made in the comments section below by copying and pasting (or better yet, linking) the URL string of your favorite service pattern, with a short paragraph to describe why you think this is the best balance of service, cost, and community impact. Entries will be judged by an impartial panel of armchair experts consisting of Clem and Richard Mlynarik (the brains behind the tool), whose own service patterns will not count for the contest. The grand prize, a big shiny ASCII trophy known as the Takt Cup, will be awarded in two weeks. Using a Train Performance Calculator, we can find out how long any given train will take to travel from point A to point B, taking into account grades, rail adhesion, aerodynamic drag, traction and braking curves, line speed limits, etc. The results of such calculations are presented below for four key types of rolling stock on the peninsula rail corridor. With these run times, you've got all the building blocks you need to build your own strings, and from those strings, your own timetable. The trip times can be downloaded as an Excel spreadsheet (82 kB) or a PDF document (106 kB) with eight separate tables (each in its separate worksheet) corresponding to the scenarios described below. They are reasonably accurate, but perhaps not down to the second. The prototype for the first set of run times is a standard Caltrain consist, with one F40 locomotive and five gallery cars. The diesel locomotive is rated at 3200 hp, and the entire train weighs 420 metric tons fully loaded with 500 passengers. The train is technically capable of reaching a top speed of 100 mph, although signal system restrictions (planned to be removed) constrain it to 79 mph today. Note: despite their bullet nose, the Baby Bullet trains have essentially the same performance. The prototype for the following run times is a Siemens Desiro Classic DMU. This DMU is in common use around the world, including here in the United States (although it is not compliant with FRA crash regulations). 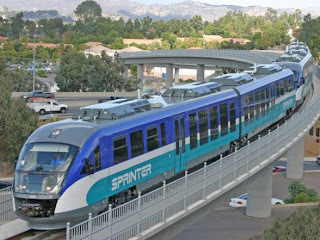 The train performance specs are based on San Diego's Sprinter, with a four-car consist as shown in the photo. Total power output is 1680 hp total for a train weighing 392,000 lb fully loaded. Top speed is 75 mph; because of this limitation, the run times are valid regardless of the track speed limit. The next set of run times is for a Stadler KISS EMU. This six-car double-deck EMU, similar to the types under consideration for Caltrain's electrification project, has a top speed of 125 mph. The spec sheet shows that the train weighs about 325 metric tons fully loaded with 500 passengers, and is rated at 4000 kW (5300 horsepower). 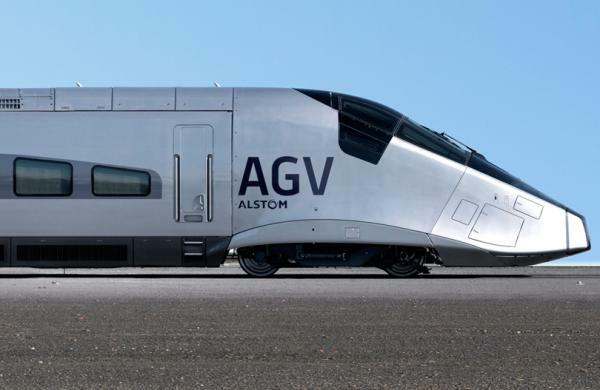 The EMU's secret weapon is the ability to unleash a short-term (few minutes) burst of 6000 kW (over 8000 horsepower), which takes it into the same performance league as a high-speed train. This is handy for performing overtakes on the express tracks without disrupting high-speed traffic--a key capability for a "blended" Caltrain + HSR plan. This trick is not possible with a DMU, which is more akin to a moped entering a freeway. The run times below are for the same train using its 6000 kW short-term rating, to be used sparingly. The final set of run times is for a state-of-the-art high-speed train of the sort that might someday be used in California. It is an 11-car Alstom AGV with a top speed of 220 mph, but used in this case at far lower speeds. The train weighs 404 metric tons and has a very high power output of 9120 kW (over 12,000 hp) as is common for high-speed trains. Generic high-speed train specifications have been compiled by the CHSRA. These run times are start-to-stop times only, with no intermediate stops, and do not include dwell or padding. Think of them as the fastest possible timing from Point A to Point B without stopping. Dwell time at stations is not included, and must be added separately. Caltrain dwell times can generally be assumed to be about 45 seconds if level boarding is not provided (i.e. there are steps into the train), or 30 seconds if level boarding is provided. Reduced dwell times can provide enormous savings for frequent-stop commuter trains. High-speed train dwell times should be (per TM-4.2 Phase I Service Plan) 90 seconds at intermediate peninsula stops, and 120 seconds in San Jose. 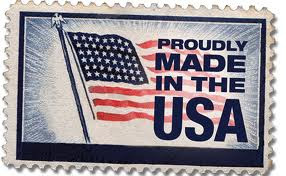 Padding is not included, and must be added separately. 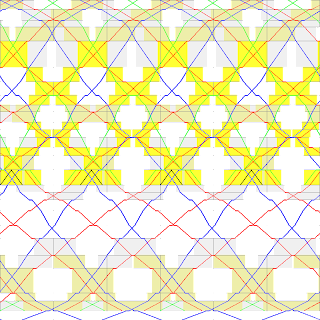 Without padding, a timetable can only be run under perfect conditions. In the real world, stuff happens, and padding ensures that the entire timetable doesn't collapse like a row of dominoes. A good rule of thumb is 20 seconds of padding per stop. By the time you get to San Jose, it all adds up to an 8:25 AM arrival... three minutes early by Caltrain's timetable, but that has some extra generous padding at the end of the run, in order to juice their on-time statistics. Once you've built a few "master" strings for the basic Caltrain and HSR service patterns that you envision, you can put them on a spreadsheet and slide them around to build the best-possible clockface timetable. When you do this, make sure that no two strings in the same direction of travel ever come within less than about 3 minutes of each other--otherwise, passing tracks will have to be added to allow the strings to touch or cross. This process illustrates how a timetable can tell you where the four-track sections are actually needed. Bear in mind the limitations of this simplified approach. The most beautiful timetable can fall apart when things don't go according to plan. The pros use expensive software that can figure out how robust a particular timetable will be to the inevitable perturbations, something that factors heavily into service planning. That particular aspect of the problem isn't dealt with here. The trip times were calculated in Octave using numerical integration of the differential equations of motion. Traction, friction and drag curves are taken from train specification sheets; where not available, these are calculated based on weight on drivers and power (for traction) and the modified Davis equation (for friction and drag). Curve and terminal area speed restrictions are included. The speed limit assumptions include: 35 mph in the Transbay Transit Center; 40 mph out to 4th & King; 65 mph at Bayshore; 70 mph at Sierra Point; 75 mph at San Bruno (assumes new grade separation); 75 mph at Millbrae; 85 mph at Hayward Park; 80 mph at Palo Alto; 70 mph at Lawrence / Bowers; 45 mph in the San Jose approach. All trip times take into account the 0.6 mile discontinuity in the milepost numbering near CP Coast. All trip times assume that the train accelerates and brakes at the maximum service rate, and maintains a margin of 2 mph below the speed limit at all times. 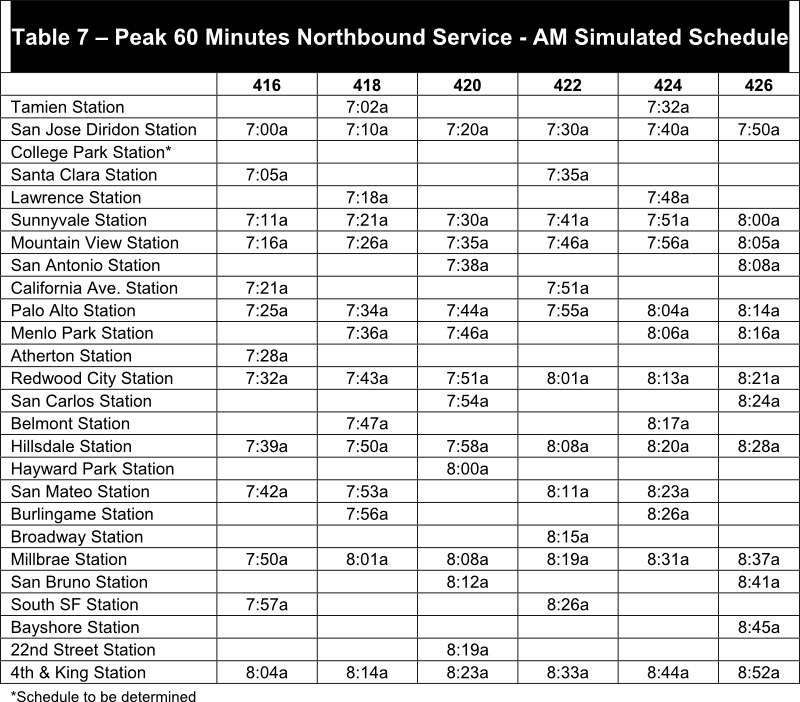 Small (few-second) differences in northbound vs. southbound trip times are ignored. Results should be accurate to about ten seconds. Your Mileage May Vary.